Is ideal to connect to the radiators in your home/office to keep check on the temperatures they are reaching. 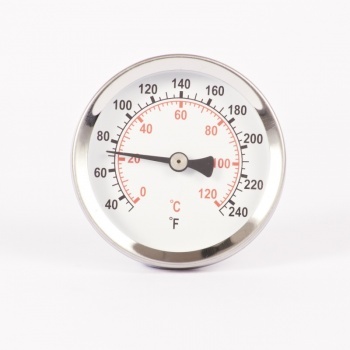 Fitting over the pipe using either the supplied spring, or a tie-wrap if the pipes are very large, the classic white faced and polished steel rimmed thermometer face will accurately display the pipes current temperature. Please Note: In the case of large pipes, the provided spring may not fit. 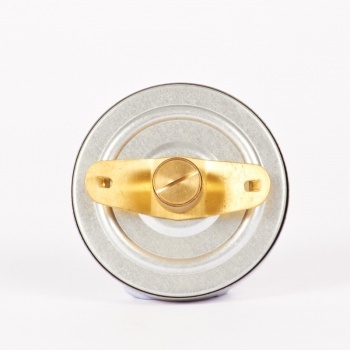 Therefore, we advise the use of a tie-wrap, wire or a larger spring. Delivered very promptly, whole transaction was trouble free. Basically measured a temperature of 61 as 50 yet measured 21 as 23 . Tried to adjust for the higher temperature but found it impossible to adjust. I bought two and they were both inaccurate. My money was refunded. Good products at competitive prices, plus fast dispatch. Couldn't be better! Works well thanks. I would have given 5 stars if it had a more robust clamp than the flimsy spring...something like a hose clamp would be better. Ordered 3 of these large dial units, easy to read but all 3 were reading 2-3 degrees different when left to stabilize for 24 hours, managed to set them reasonably accurately using a reference digital thermometer. All set in place now and pleased with the results. 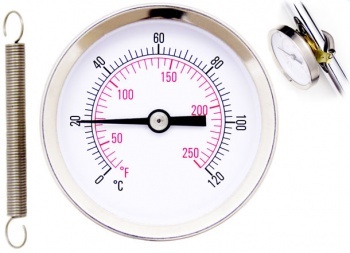 These thermometer are easy to adjust, with the screw on the back of the thermometer, these are designed to be left in place on the pipes. If there was an issue why not contact us about the issue, This is after all what customer service is about, But if we don't know there is a problem how can we solve the problem. Goods received morning after making order. Pipe thermometers a bit fiddly to use but they do the job intended.